Agartala/Aizawl, Aug 26 : A central team arrived here on Monday to take stock of the condition of Mizoram's displaced Reang tribals, locally called 'Bru', living in refugee camps in Tripura, an official said here. About 35,000 Reang tribals are staying in seven camps in Tripura for about 17 years after they fled their villages in Mizoram following ethnic troubles after the killing of a Mizo forest official. "The union home ministry has recently constituted a seven-member committee headed by Rajiv Gauba, the ministry's additional secretary, to oversee the condition of the refugees in the Tripura camps," Swapan Saha, Tripura's relief and revenue department secretary, told IANS. "The central team arrived here today (Monday) and they would visit the refugee camps tomorrow (Tuesday)," Saha said. He said the central team, also comprising officials of the human resource development ministry, social justice and empowerment ministry, Tripura government and representatives of three NGOs from New Delhi, West Bengal and Assam, will submit its report to the union home ministry and the Tripura High Court by Sep 12. The central team was constituted following a directive from the Tripura High Court, which passed an order June 24 after a lawyer filed a petition on the alleged miserable conditions of the refugees and the camps they are living in. "The central team would oversee the sanitation, health, educational and other facilities there," Saha added. Meanwhile, Tripura Governor Padmanabha Balakrishna Acharya visited the refugee camps Sunday and told them that Prime Minister Narendra Modi has sent him to see the conditions of the displaced people. "Do not be upset, good days are ahead for you. Narendra Modi-led government at the Centre would resolve all the problems of all of you," the governor told the refugees while addressing gatherings of migrants in different camps. Refugee leader and Mizoram Bru Displaced People's Forum (MBDPF) general secretary Bruno Mesha submitted a memorandum to the governor. The memorandum contains 10 demands which included providing all facilities to the refugees like Kashmiri Pandits and Tamil refugees, allotment of lands to all the repatriated tribals, creation of model villages in Reang tribals' inhabited areas, ensure better security and sanitation, health and education to the tribals in Mizoram. Acharya, who is the governor of Nagaland with additional charge of Tripura, promised the refugees to take up their matter with the central government. 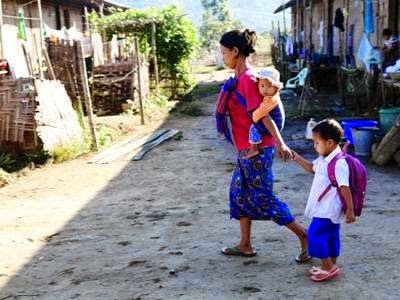 The Mizoram government recently asked the union home ministry to take up with the Election Commission the issue of deleting from the electoral lists the names of those refugees, who are unwilling to leave Tripura camps and return to Mizoram. "Mizoram Chief Minister Lal Thanhawla earlier this month held a meeting with Home Secretary Anil Goswami in New Delhi and requested him to take action over deleting the names of those refugees who are not willing to return to Mizoram," an official of the Mizoram government told IANS in Aizawl. "Lal Thanhawla apprised Goswami that while the state government has done its best to take back the refugees from Tripura camps, the state government's efforts have often been opposed by a section of refugee leaders," the official said. The Tripura government has been repeatedly asking the central government to take steps to repatriate the 35,000 tribal refugees to Mizoram. Only about 5,000 Reang tribal refugees have returned to their homes in the past three-and-a-half years.